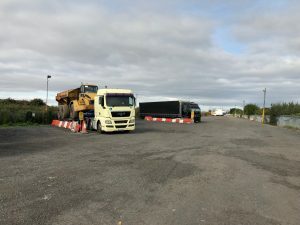 Those of us in the transport industry know there is a chronic shortage of overnight suitable parking for lorry drivers and while big truckstops with lots of facilities are all well and good, sometimes they are not commercially viable in areas where the traffic might not warrant the investment. So it’s good to see there are plenty of smaller establishments that still offer drivers the chance for a decent meal, at an affordable price, a shower and a place to park their trucks without inconveniencing others. The Whitley Bridge Truckstop in Goole is just that. 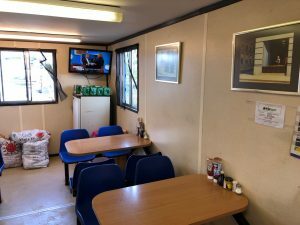 It might not look too inviting – Kathy’s café is basically a converted container, but inside it is very welcoming indeed and the food is good, and very reasonably priced. Everything about this site is value. It’s cheap to park, the food is excellent value and it has service with a smile. It might look basic, but if you are in the Goole area then it’s a good place to stop. One word of warning, it is right by a busy railway where there are lots of freight trains, so if you are a light sleeper, then try to park on the side away from the railway. Either that or take up trainspotting. The popular Full English is just £5.50 and for that you get a good serving – three rashers of bacon, two sausages, two eggs, beans, tomatoes, mushrooms, toast and a choice of a mug of tea or coffee. That is excellent value – many places charge more for less! There is also the small breakfast on offer which comes with a single rasher of bacon, a sausage, an egg, beans, tomatoes, bread and butter or toast and a brew for £4. 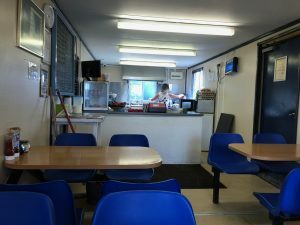 For those wanting a quick getaway or just not fancying a full breakfast then a bacon or sausage sandwich is just £2 and a fried egg sandwich is £1.50. Bacon or sausage with an egg in a sandwich or a roll is £2.50. Beans or scrambled egg on toast is £3 while beans on toast with an egg is priced at £3.50. There is a selection of lighter and main meals served throughout the day. For example, fish fingers with chips and beans is priced at £4.50. Double egg with chips and bread and butter is £3.50. Three sausages with two eggs, chips, beans, bread and butter and a tea comes in at £7 as does gammon, with two eggs, chips, beans, bread and butter and a brew. A cheeseburger is priced at £3 while to have it with a side order of chips will set you back just £4. A jacket potato with beans or cheese is £3, or you can have both of these fillings in your spud for £3.50, which is the same price as a tuna mayo jacket. A ham or tuna mayo sandwich is £2.50 while a simple chip butty is £2. There is a small range of daily specials, usually priced at £7. On offer when we visited were home-made steak pie with mashed potatoes or chips along with peas or mushy peas. That was joined by braised steak with mash, Yorkshire puddings and peas and also cheese and caramelised onion quiche, with ham, cheese, egg salad, coleslaw and chips. All include bread and butter and two hot drinks. There’s not a great deal of room to sit down, about 16 diners can be accommodated at any one time. Inside there is a TV showing free view channels. It costs just £10 to park for 12 hours (plus you get two hours free) and that even gives you a shower. 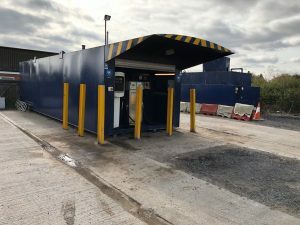 The site is open 24 hours, 365 days a year and you can get fuel as well via Keyfuels. There is 24/7 security and the site has CCTV and floodlights and a security guard. There is room for up to 100 trucks can park here overnight, though entry is via a single gate. Overall, though this is a good place. 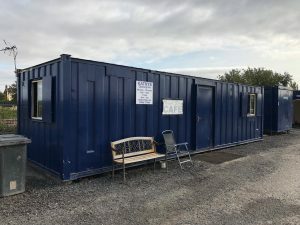 As I say, don’t be put off by the container – they do a great job inside there serving good grub!